Gil McElroy is a poet, independent curator, art critic, and visual artist. He has published four books of poetry, most recently Ordinary Time (Talonbooks, 2011), and numerous chapbooks that include Ordinary Time: The Merton Lake Propers (Baseline Press, 2012). He is also author of Gravity & Grace: Selected Writing on Contemporary Canadian Art (Gaspereau Press, 2001) and the memoir Cold Comfort: Growing Up Cold War (Talonbooks, 2012). McElroy writes about visual art for publications in Canada and the United States, and is a regular correspondent for Akimblog in Canada and re:sculpt in the United States. As a practicing visual artist, he has been collaborating with Halifax-based artist Peter Dykhuis on a series of site-specific gallery exhibitions based on abandoned Cold War military installations in Canada. Gil McElroy is the author of five chapbooks with above/ground press, including Echolocations (1/2 of STANZAS #5, 1995), Some Julian Days (1999), Meteor Showers: A Descriptive Catalogue (STANZAS #31, 2002), (The Work of Art) In the Age of Mechanical Reproduction (2005) and Twentieth (2013). He lives in the village of Colborne, Ontario. 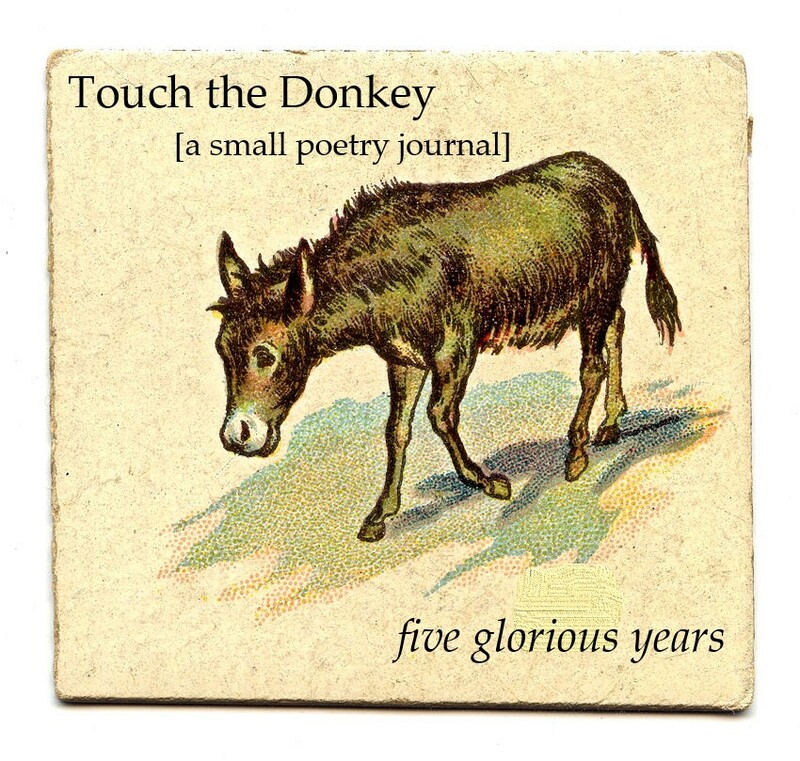 Three poems from “Some Doxologies” appear in the first issue of Touch the Donkey, with two more scheduled to appear in the third issue. Q: “Some Doxologies” appears to be an extension of the “The Julian Days” poems. In your mind, what is the distinction between this new work and what came before? A: “Doxologies” didn’t begin as an extension of The Julian Days, but as I worked into it I found it began to function as a kind of subset of that open-ended poem sequence; the new poems have become daily poems. The pieces comprising The Julian Days jump about hither and yon, abruptly shifting in tone, mood, and subject from one poem in the sequence to the other. There’s nothing intentionally binding one to another beyond the conceit of the dating system and the fact that they are, indeed, daily poems. Doxologies, on the other hand, is perhaps more compressed and intentional in mood and focus, When I sent out one as a New Year’s gift, I actually had someone contact me and ask me if I was okay, It had never occurred to me that there was, say, some bleakness to the pieces. But she picked up on it right away, and responded immediately to that (and bless her for her concern). If there is indeed bleakness, it’s not formally or structurally intentional, but I guess simply responsive. They are, as per the title, intended as kinds of prayers, though not in an overtly religious or spiritual manner, and prayers are responsive things. Q: The “Julian Days” poems have been included as sections in all four of your poetry collections. What originally prompted the series, and how do you think the series has evolved over the years? Where do you think it might be headed? A: I’d been making attempts at some variation on the “day book” (for lack of a better term) for a while, and nothing quite gelled. The penultimate version was entitled “dd/mm/yy,” but it failed as well (though a few poems from it were eventually incorporated into The Julian Days. What I’d been trying to avoid was some kind of totalizing calendrical specificity, wanting not to strongly and indelibly link a poem to a specific day, and yet somehow, in a subtler way, incorporating or creating or merely just suggesting the notion of that kind of linkage. I wanted the poem to be able to stand aside and away and on its own, without the day of composition ruling supreme. And I’d about given up when The Julian Day system suggested itself. I have an abiding interest in astronomy and cosmology, and the Julian Date (essentially an arithmetical accumulation of all the days that have amassed since January 1st, 4713 BCE) is commonly used by astronomers to date celestial events like the brightening or fading of variable stars. Perfect! A number creates enough abstraction that I could date the poems without permitting those dates to dominate them (and there are websites where you can plug the Julian Date in and get the day of the civil, everyday calendar – or vice versa). There really is no “headed” for the series. It’s open-ended on either side of the timeline (I have worked backwards into it), and will presumably end if I die or get bored of it. I think there’s a fair amount of variation amongst individual poems, reflective no doubt of where I was/am/will be when I contribute pieces to it. “Doxologies” is the first significant sub-unit within the series, though “I/O: A Colborne Psalter” started out as a number of Julian Days. Q: You’ve been writing and publishing since the 1970s. Is the process any different for you now than it was then? A: I no longer have a manual typewriter, and my beloved IBM Selectric is, alas, toast. And I no longer use cheap yellow paper to do my drafts on. And I don’'t smoke anymore. And my hair is shorter (though in my mind, it is forever waist-length, and much thicker). I guess other than that my working methodology hasn’t changed much. I still keep notebooks and rather than writing until five in the morning, I get up at 4 a.m. to write before the day gets out of my hands. Precious time. Q: Are you suggesting there’s no real difference? How do you feel your writing has developed over the space of some three-plus decades of activity, or is everything you do, perhaps, part of a single, extended trajectory? A: In the late 1970s/early 1980s, I was working very hard at not feeling anything at all – or at least, as little as I possibly could. I won’t get into the specifics of why, but if the right drug had been made available to me then, I think would probably have worked my way into it. Thankfully it wasn’t. So I was on my own in terms of trying hard to cut myself off from what I felt. And my poems at the time were extremely reflective of that process of attempted disengagement – clinical, detached, airless, compressed to the point of near extinction so as to try and wring out any possible emotional response I might have tried to show. And much of it got published in magazines of the period. By the mid-1980s, I stopped trying to do all of that, and began opening some doors, airing out the proverbial sheets, allowing myself to experience and feel and basically become human again. I re-discovered my heart, and the poems that came obviously changed in sync with that opening; much of the work in Dream Pool Essays, my first book, was written in that period. So I guess I wouldn’t think of things as a single, extended trajectory; while I don’t disavow the poems of non-feeling (they are, after all, a part of who I was), I place them a bit apart and aside. They’re their own mini-trajectory that had nowhere to go but extinction. A: I’m not at all sure I understand what you mean. I guess I tend to write towards the whole, and not in fragmentary isolation – if that is in any way addressing your question. My notes are full of lines – things I’ve mis-heard, mis-read, lines I just randomly generate in a frenzy of surrealist free-association on paper. I do that in bursts, accumulate things, and later – sometimes decades later – I go back and mine into it, finding a line that acts as a trigger for other lines. The individual lines themselves mean nothing, though I sometimes use them in visual work or even as my Twitter postings, enigmatic, out-of-context fragments of text that might tease or annoy or totally vex. Maybe that’s the closest I can get to answering your question. Q: Is the collection and accumulation of sketched lines a normal part of your compositional process or simply one of a number of your processes? A: It’s the primary compositional process I employ. There are others, but they are usually project-oriented, and don’t extend beyond the work at hand. The notebooks of accumulated lines stand on their own – I keep the old ones close at hand and use them regularly, and have two notebooks on the go at all times. Virtually everything comes out of them, even the fewer “I did this/I did that” poems (usually in The Julian Days) come from notes of things that happened. But the notebooks are mainly comprised of free-associated lines. Paul Eluard. The Surrealists in general, my first major influence when I began taking poetry seriously. Charles Olson, Robert Duncan, Robert Creeley – turned onto by the good folks at Printed Passage Books in Kingston when I was at university, and still love. But mainly oodles of non-fiction, primarily in the fields of cosmology and astrophysics. Incredible stuff that can't help but change how you perceive the world. And really, isn’t that what it’s all about?